Lightly brush both sides of the sliced baguette with melted butter. Place them on a baking sheet and put them in the oven about 5 minutes, or until they are just starting to golden. Do the "poke" test with your finger to make sure they are still soft in the center. Let these cool to room temperature. It's ok if they are still a little warm when spreading. Peel and press the garlic cloves. Mash together 6 oz of laughing cow cheese, 2 garlic cloves and 1 Tbsp of mayo. 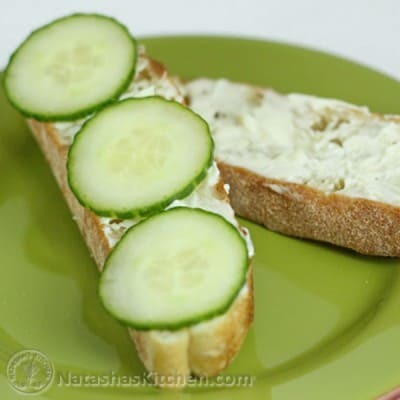 Spread desired amount on each baguette slice and top with a sliced cucumber. I used an artesian flat bread for the picture since I served these with dinner. Yeah- I can't imagine eating those in one bite!!! These are great as-is, but I like cucumber because it adds an element of freshness.